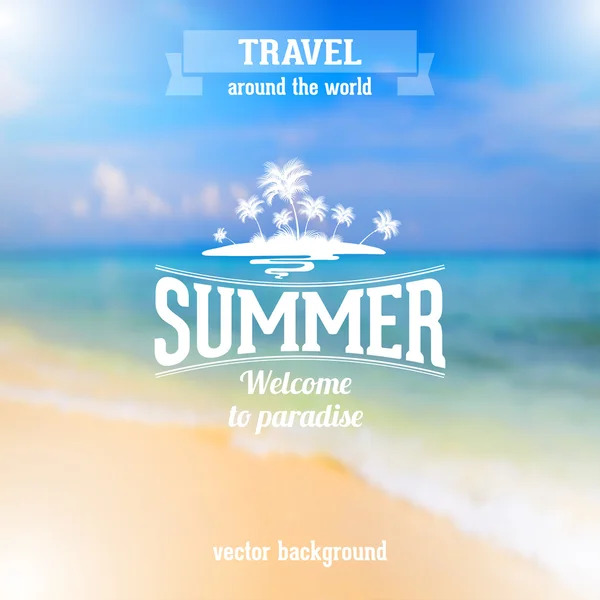 Summer seaside view poster with type on defocused beach background. Vintage vector illustration. blue, vector, background, on, view, illustration, design, sky, beautiful, happy, holiday, travel, palm, summer, nature, sunny, best, sea, style, card, retro, vintage, time, tropical, landscape, concept, Text, with, advertisement, clouds, template, beach, ocean, seascape, tourism, sand, vacation, resort, journey, paradise, hawaii, dreams, postcard, poster, type, tour, place, island, seaside, Defocused, typography, lettering, postcards, Illustration.